A large number of state Congress leaders and workers, including legislators, who had earlier expressed differences with Punjab Chief Minister Amarinder Singh, today turned up for a meeting to discuss arrangements for Ms Sonia Gandhi’s scheduled visit to Bathinda later this week. Punjab Chief Minister Amarinder Singh and Agriculture Minister Rajinder Kaur Bhattal at a meeting to review the arrangements for Ms Sonia Gandhi’s Bathinda visit in Chandigarh on Sunday. 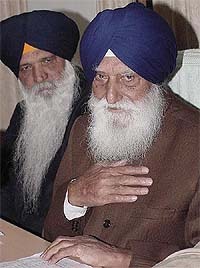 SGPC chief, Mr GS Tohra, is angry with Prime Minister Atal Bihari Vajpayee’s silence over Sikh religious places during his recent visit to Pakistan. Mr Tohra said today that before the visit he had written to Mr Vajpayee to take up the issue regarding the upkeep of Sikh gurdwaras with the Pakistan Government, especially President Pervez Musharraf. New bridges are being built to establish people-to-people contact between two Punjabs. While the monthly Punjabi magazine, ‘Lehran’, published from Lahore took the initiative to publish literature in ‘Shahmukhi’ (Persian script) and its transcription in ‘Gurmukhi script’ simultaneously, many Punjabi writers in Pakistan have started following the trend. PPCC chief, H.S. Hanspal, has criticised the sops announced by the BJP Government to woo the voter. 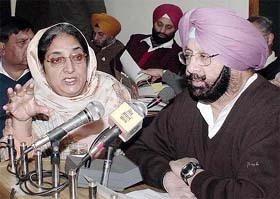 Terming these announcements as political bribery, Mr Hanspal said that the Central Government had slept over issue of concessions in income tax returns for the salaried class for more than four years of its tenure and now on the eve of these elections, the government was reaching out to the common man. A sum of Rs 2 crore will be released for the two remaining phases (IV and V) of galiara yojna (beautification and decongesting of the surroundings of the Golden Temple) of the holiest Sikh shrine. The Punjab Government’s ambitious plan to establish a Focal Point at Chanalon in Ropar district with better infrastructure in 1991-92 is yet to become a reality as till now only 45 to 50 units, of the 250 small-scale units are functioning in the area. Expecting early Lok Sabha elections, the SAD leadership has started making efforts to organise a show of strength during a conference at Maghi Mela. Apart from it, the SAD leadership has also been preparing the poll agenda which is likely to be unfolded before the huge gathering at the conference. Members of the district unit of SAD (A) headed by Mr Simranjit Singh Mann, yesterday urged the Jathedar of Takht Damdama Sahib, Giani Balwant Singh Ji Khalsa, to make efforts to bring unity among various Akali Dals with the help of the Jathedars of the other takhts of Sikhs. Ludhiana is all set to have a full fledged centre for autistic children. After an intensive survey of the extent of this learning disability in the city, Savera School for Rehabilitation, a Chandigarh-based voluntary agency which has long been working in the area of mental and learning disabilities like dyslexia and autism, has decided to open a school for autistic children in Ludhiana. Alleged fake labour societies in the district have become a bone of contention between contractors and persons running the societies. Contractors and the office-bearers of labour societies several times had tiffs in government organisations like the municipal councils and thermal plant in the past few months. Encroachments on municipal land can be seen at many places in the town. Though a major chunk of land has been given on lease, remaining is open for influential persons to encroach upon. The council itself is also not lagging behind. The illegal plying of buses along the banks of canals in the district is not only threatening the life of commuters but also endangering the canal banks. A large number of minibus operators in the district have started plying buses illegally along the canal banks in the recent past despite objections by organisations maintaining the canals. Cutting across party lines senior leaders of various political parties, including the Congress, SAD, SAD (A), CPM, CPM (Pasla), Lok Bhalai Party and CPI along with thousands of persons from different parts of the state today attended the Shardhanjli samaroh at the new grain market here organised to pay tributes to comrade Bhan Singh Bhaura, MP from Bathinda, who died on January 3 in New Delhi. The legendary Sobha Singh may have given the Sikh gurus faces we know, but there are a few faces of the gurus unearthed by noted art scholar Mohan Singh, a former Director of the State Cultural Affairs and Archives Department. 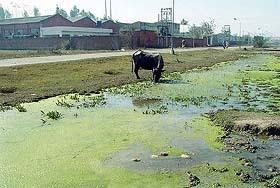 Finance Minister Lal Singh today said that Rs 50 lakh was being spent on the development of Bhunerheri area of the district. He made this statement after laying the foundation stone of a road being constructed from Gharaam to Mehmadpur via Jlahkheri. Eighteen-year-old Vikas Uppal of Rohtak was the cynosure of all eyes at the local Konica Resort on the G.T. Road today. 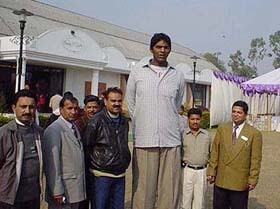 The reason: He is 8 ft 3 inches tall, and claims to be the world’s tallest youth. He had come here to attend a social function. Uppal disclosed that his hands were 13 inches long while his foot were 19 inches long. Dr Anupam Barik, Director, Cotton Development Directorate, Mumbai, said the target of producing 150 lakh bales of cotton will be achieved by the end of the season and more than 140 lakh bales were already in the market. The district police claims to have arrested two persons in connection with a blind murder case. Sukhdev was in jail. His wife Jaswinder Kaur developed illicit relationship with his-step-brother-Dalip Singh. Dr Tara Singh Kamal, Principal of Guru Tegh Bahadur Khalsa Institute of Engineering and Technology, Chhapianwali (Malout), has been elected honorary president, engineering science section, at the 91st session of the Indian Science Congress Association.